Waterproof lace up combat style bootie with eight eyelets. 7 inch shaft. Inside zipper for an easy on and off. 7 inch high shaft. Rubber lug sole. 1 3/4 inch leather stacked heel. Made in Canada. 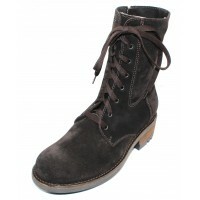 Waterproof lace up combat style bootie with eight eyelets. 7 inch shaft. Inside zipper for an easy o..